When most people think about bees and where they live the first thought is the honeybee and their well-organized hive full of hexagonal wax comb and thousands of bees laboring away. Honeybees are social insects, meaning there is a division of labor between individuals occupying the colony or hive. However only six percent of bee species are social with the vast majority being solitary in their nesting. There are approximately 4,000 species of native bees in North America and a current study has identified 542 species in Georgia. Native bees will nest in the ground or in cavities like hollow stems or bored holes in wood. Many species of native bees are actually much more effective than honeybees at pollinating flowers on an individual level. According to Xerces Society, only 250 female orchard mason bees are required to effectively pollinate an acre of apples. This same task would typically require 1.5 to 2 honeybee hives or approximately 15,000-20,000 foragers. There are many reasons why native bees are more effective pollinators than honeybees. Many native species of bumblebee and mason bees are more active in colder and wetter weather than honeybees. Unlike honeybees many native bees perform buzz pollination, where the female bee grabs onto a flower’s stamens and vibrates her flight muscles-releasing more pollen from the anthers. This behavior increases cross-pollination and even fruit size for crops like tomatoes. Honeybees also use nectar to pack pollen into their pollen baskets to carry back to the hive. The nectar wets the pollen, which make it less viable to the next flower she visits. Adding native bee nest sites is one of the easiest ways to increase pollinator numbers in your garden. The most common types of nests are drilled wood or bundles of hallow tubes like straws or thin bamboo. Placement of nests should be south or east facing and placed three to eight feet off the ground. Bamboo, cardboard straw, pithy or hollow stemmed plant pieces like elderberry or blackberry should be cut into six to eight inch pieces. Tubes should have a back or stop so things like straws should be placed in a wooden box. Bundles should contain 15-25 straws or tubes and can be mounted to structures or trees. I have a few nests that are fit into pieces of 4” PVC that is cut a few inches longer than the straws to protect the straws from rain. This Stem nest is a 4″ pvc tube that is filled with bamboo and paper straws. I love the various colors of mud caps! 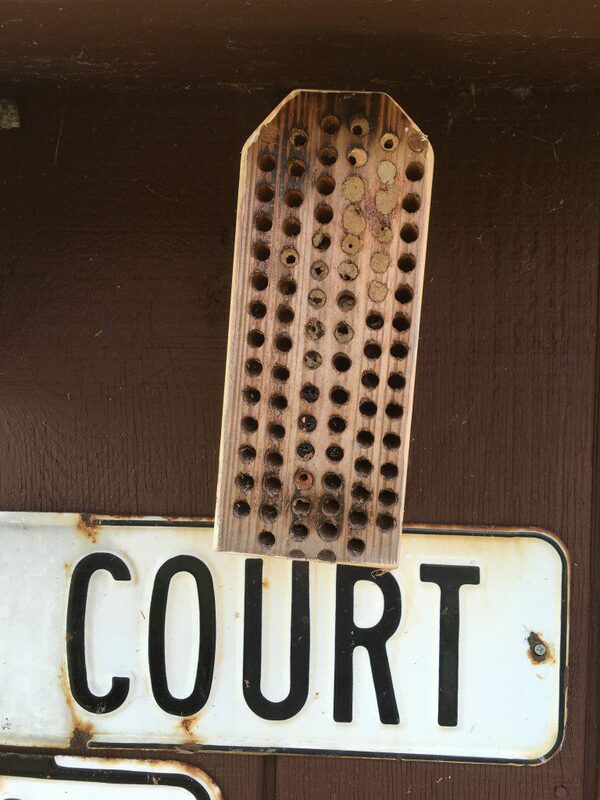 One of my native bee nests made of untreated wood and drilled holes. The native bees that fill these cavities are mostly univoltine species, or they produce a single generation each year. These bees typically only live four to six weeks, where they are entirely focused on reproducing, laying eggs and provisioning food away for the next generation. She will make individual cells in the cavities where she will lay one egg and pack away little balls of pollen that she collects on an average of 2-20 foraging flights. Once there is enough food provisioned away, she collects clay to seal the cell and then begins working on the next cell. It takes about 24 hours for her to complete one cell. One female may produce 20-40 eggs in her life, which will typically fill 2-5 straws or cavities. These cavities will then sit, sealed over in clay or grass until environmental cues like temperature or humidity will trigger the emergence of the next generation of adults. The interior view of a bamboo straw that was filled by a native bee this season. 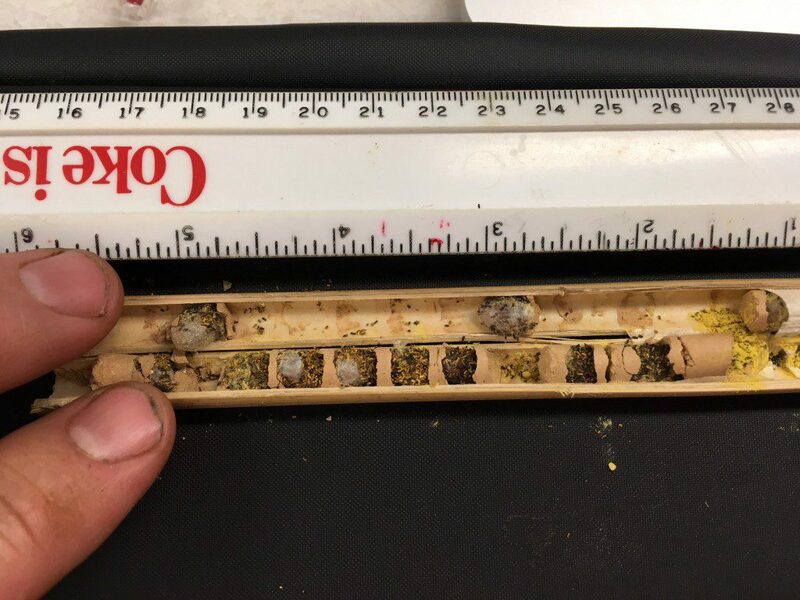 Each cell is separated by clay walls and contains an egg and pollen balls that will provide nutrition to the bee until it reaches adulthood next spring. 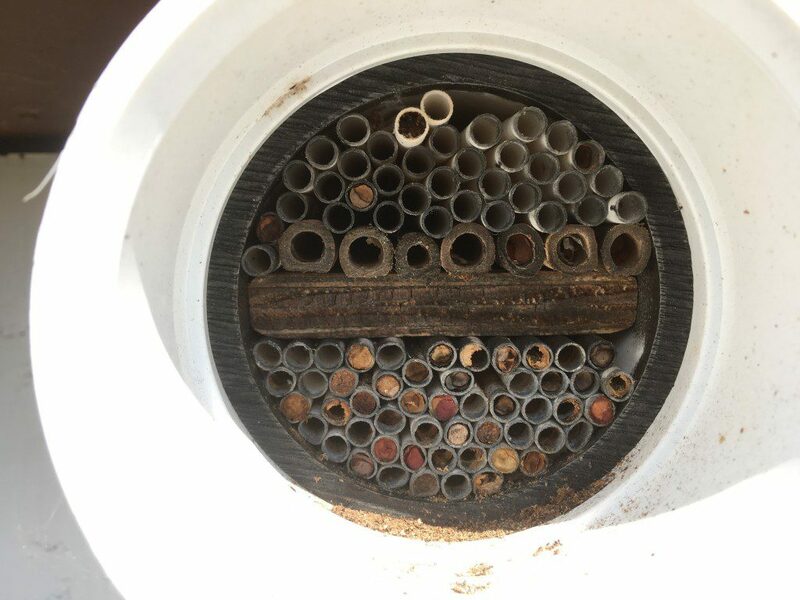 I have kept native bee nests for three years now and I have thoroughly enjoyed watching the tubes be filled each spring. I think they are a great way for the average home gardener that just wants to enhance pollination and diversity in their landscape without having to invest time and money to learn the intricacies of keeping honeybees. The only thing I am missing is the honey. Posted in Bees, Beneficial Insects. This entry was tagged Beneficial Insects, native bee nests, native bees, pollinator gardening, Pollinators. Bookmark the permalink. Honey is a miraculous product. Some says, real honey never spoils in nature while archaeologist found unspoiled honey in some of Pyramids or in tombs of ancient pharaohs. Pharaohs have pretended that there will a eternal life and when they incarnate again, they’ll need food so they put honey in their tombs. Honey bees always surprised me whatsoever. Still lots of secrets starting from their hexagonal hives to the unspoiled honey. I enjoyed reading this article. I am happy to have the pollenators in our yard , but I really enjoy feeding Hummingbirds. This year, more than any I can remember in the recent past, it has been quite a challenge due to an excessive amount of bees in our yard. I’ve tried moving the feeders to hopefully confuse the bees from finding the location, but that has not worked. Bee guards on the feeders have not helped either. The poor Hummers are often unable to feed due to the quantity of the bees bothering the feeder. It has been a challenge to enjoy my Hummingbirds this year.